As a form of digital content, e-Textbooks make learning content portable, transferrable, and searchable. Such technology increases students' engagement in learning and make learning highly interactive. However, the adoption of using e-Textbooks in higher education is far from its confirmation stage. This study examines the relationship between perceived attributes of using e-Textbooks by instructors and their actual use of e-Textbooks in higher education. A survey study has been conducted to measure how instructors from public universities in colleges of education perceive using e-Textbooks in higher education. The findings suggest that instructors, institutions, and e-Textbooks publishers should work collaboratively to enhance the use of e-Textbooks in higher education. 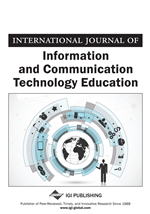 This study investigates the relationship between perceived attributes of e-Textbooks by instructors and their use of e-Textbooks in teaching. The literature explores factors that influence instructors’ decisions of adopting e-Textbooks in higher education. The two main sections of literature that includes the influence of digital content and the learning and adoption of e-Textbooks in education frame the environment in which this study takes place. Within this framework, Rogers’ (2003) perceived attributes and diffusion theory help guide the research design, data collection, and analysis of this study. Digital content applies to digital learning as a way to change and enhance current education. In a digital learning environment, the creation, development, and selection of highly-qualified digital content to facilitate education and maximize the benefits of digital learning is vital (Levin, 2011). A universal definition of digital content does not exist. All content that is “electronic in nature that supports or acts as the curriculum and helps students learn,” and “delivering traditional content used in the classroom through a technology-based mechanism” (Center for Digital Education, 2013, p. 5) is included. This can be “as simple as an article scanned into a computer for one class,” and can be “as complex as all instructional materials being digital” (p. 5). No matter what format the digital content appears in the instructional process, digital content enables learners to access learning with personalized experiences that “aligns to different learning styles, educational goals and overall learning outcomes” (Levin, 2011, p. 5). Digital content is crucial to educators and learners in digital learning because they enhance both traditional schools and non-traditional schools by “providing blended or hybrid educational opportunities for students, as well as teachers” (Center for Digital Education, 2013, p. 14).